I had all kinds of grand intentions of getting this recipe posted on Friday…but that just didn’t happen! After getting home from the Atlanta Savings Nation class (which was AMAZING folks!…you have got to go to one if it comes to your area! ), I took the boys down to Cincinnati to the Lego Kidsfest on Friday night. Let’s just say that they were in little boy heaven. The tickets were a little pricey for my taste, but after being there and seeing the glee and joy on their little faces I’ve decided that it was worth every penny! And when I asked Charlie what he’d like to do for his birthday party in a few weeks…what does he want? A Lego party! So I was able to finally make this Thai Chicken pizza this weekend…great bold flavors on a soft, homemade pizza crust. Perfect for a Saturday dinner at home! 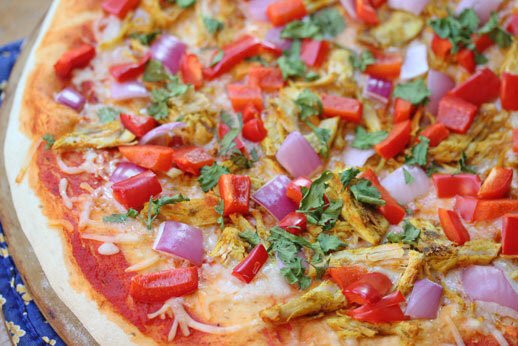 Serve Thai Chicken Pizza with fruit and veggies. Cliantro is .33 a bunch here at the very lowest, and up to .50 a bunch. Where did you get 3 bunches for .25? I used probably about 6 “stems” and was trying to figure out the best word! Awesome. It looks so tempting. Your pizza looks great! I have been enjoying the great sales on asparagus and am sharing a recipe for asparagus and pasta salad.